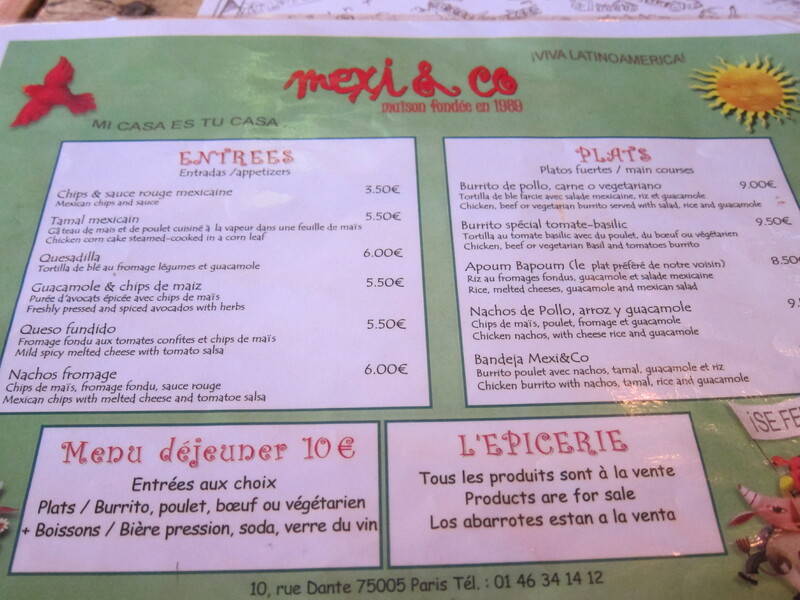 Mexican Food In Paris? Non! Si! So- what was your first clue that I had a great day? How did I happen upon this little South of the Border oasis, you ask? 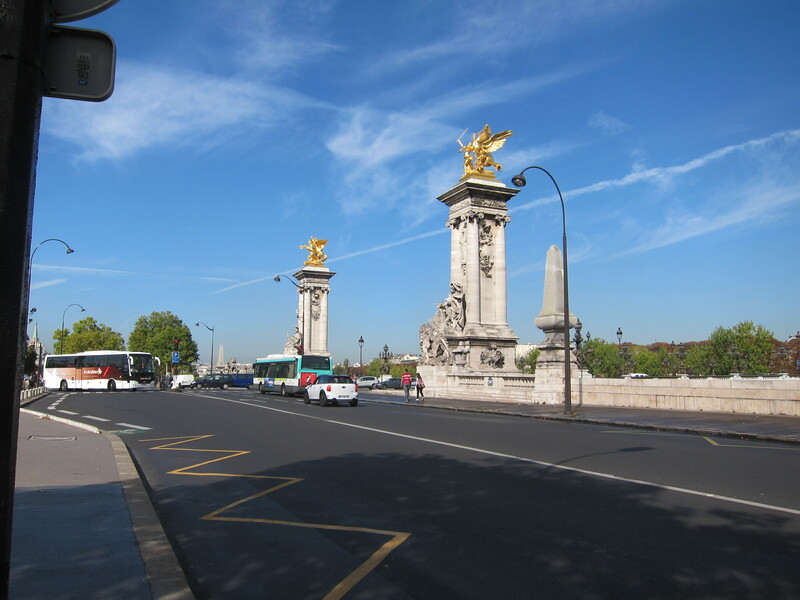 Well- today was one of those rare Paris days when one could wear a light-weight , long-sleeved cotton shirt and be perfectly comfortable with no jacket of any kind. It was so gorgeous I knew I needed a field trip, particularly after it became clear that my not-so-handy handyman was not going to show up yet again. (So what if my parents are coming to visit on Sunday and right now their bed is covered in the curtains that need to be hung in their room? And yes, we have been eating supper in the dark because the light fixture for the dining room is still in a wooden crate in the corner. I could go on , but this post is about why today was wonderful, so I’ll spare you the boring details of my rage.) I decided to go in search of what I thought was a grocery store that carried hard- to -find ingredients for Mexican food. 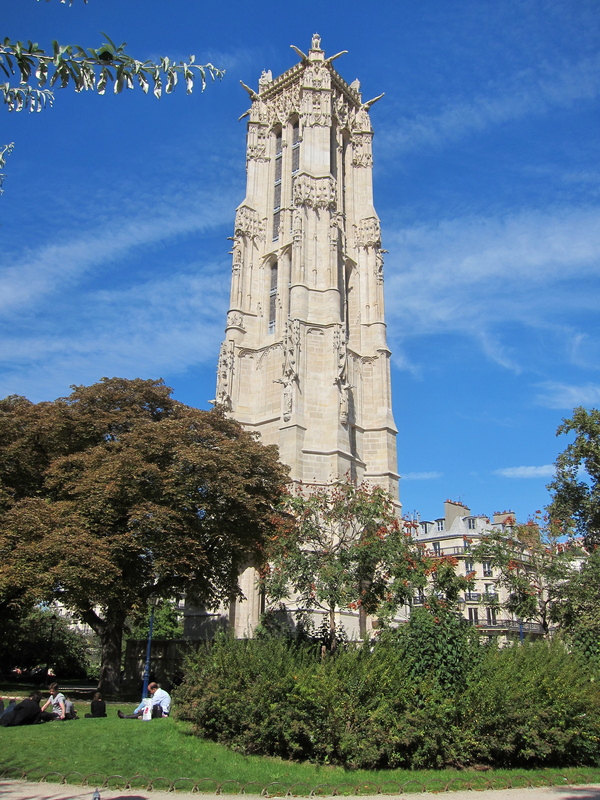 It was close to the Sorbonne, which is one of my favorite areas, so it was a perfect destination for this amazingly beautiful day. Although kind of a pain to get to on the metro, this neighborhood is an easy ride on the bus. And since we all know that I am now the Boss of the Bus, that’s what I did. I caught it by my building and changed just across the river. Here is the view from that bus stop. Not a bad place to wait two minutes for a bus. The next bus drove down Blvd. 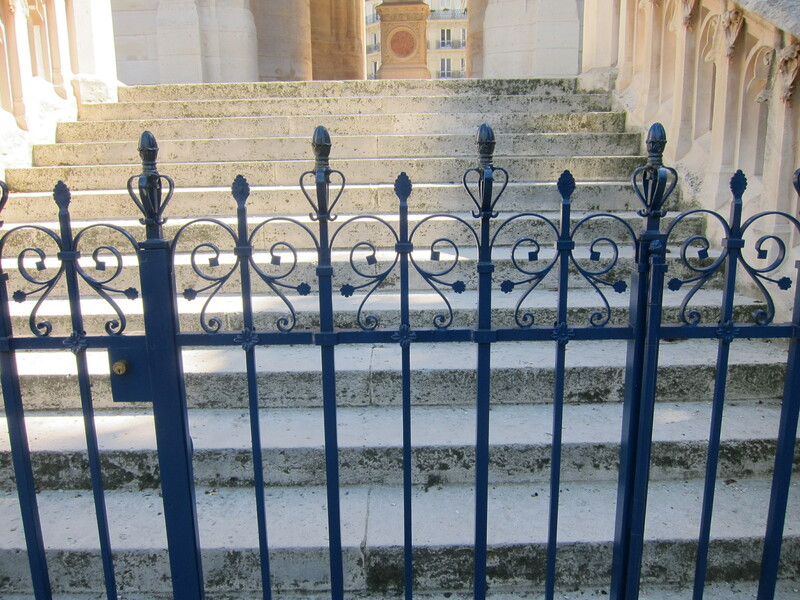 St. Germain, which was particularly lovely today. I got off in front of the Cluny museum (which I haven’t yet been inside but will when the weather turns bad) and then strolled along the boulevard. 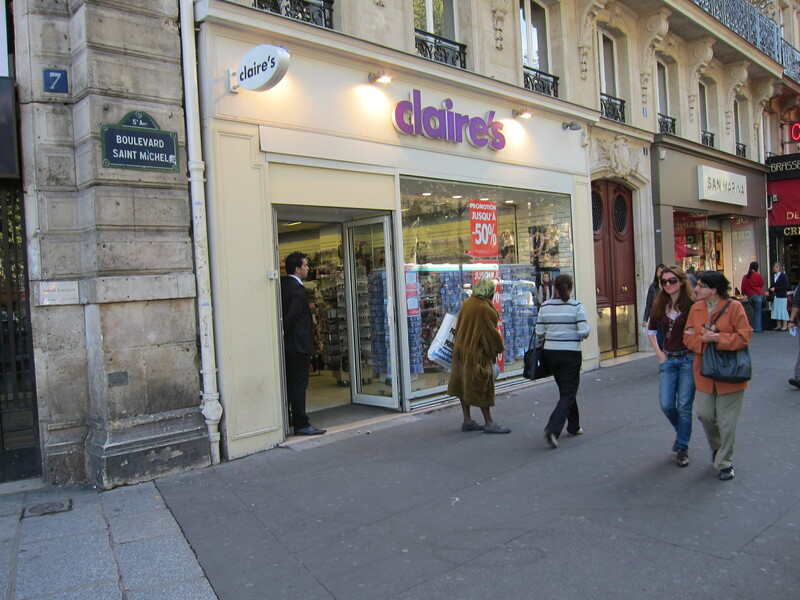 I was relieved to see that Paris has a location of Claire’s. We send all our best stores over here, I guess. Whew. So good to know. 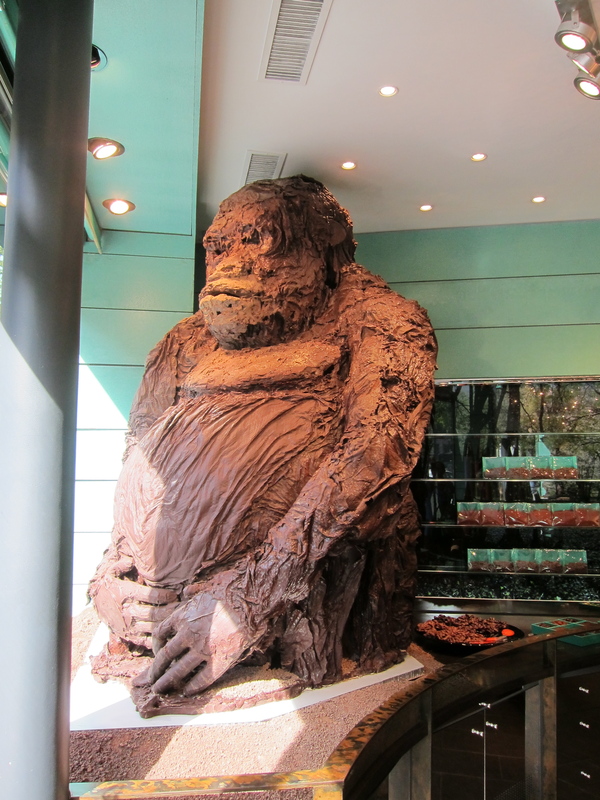 Continuing, what should I see but this enormous chocolate gorilla? A heck of a lot better sight than Claire’s. After a few wrong turns I reach my final destination. 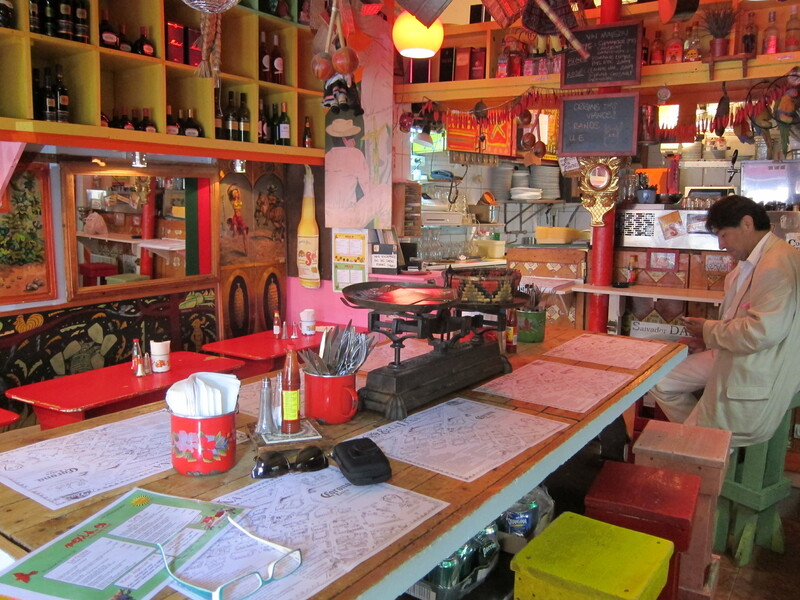 Mexi and Co. is a tiny but tres cute Mexican cafe, which also happens to have some cans and jars of things like peppers, mole, beans, hot sauce (not salsa), and taco sauce for sale. I was happy that I hadn’t eaten lunch yet, because I was so thrilled to fill my stomach that it didn’t matter that there was nothing I wanted to fill my shopping bag with. Too bad the car is blocking view of the four bright pink tables on the sidewalk, which were, sadly, full. 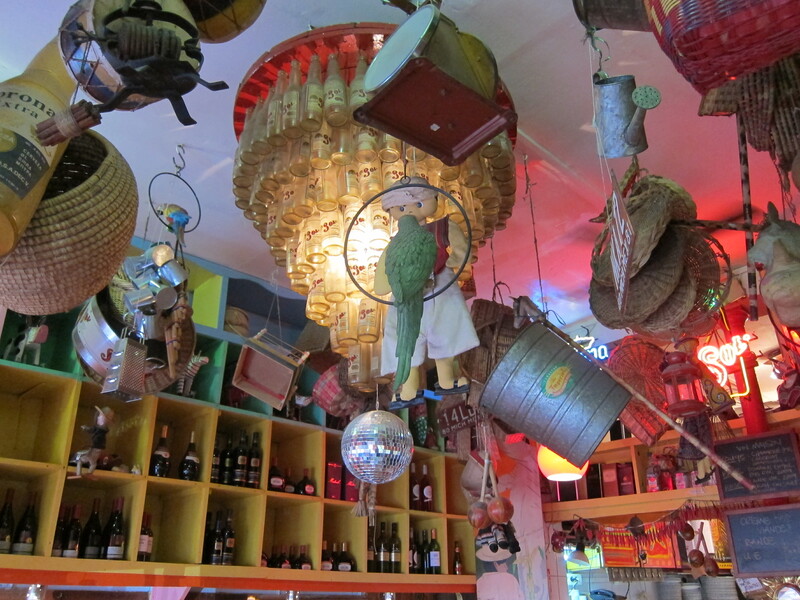 a ceiling befitting of a Mexican eatery, si? 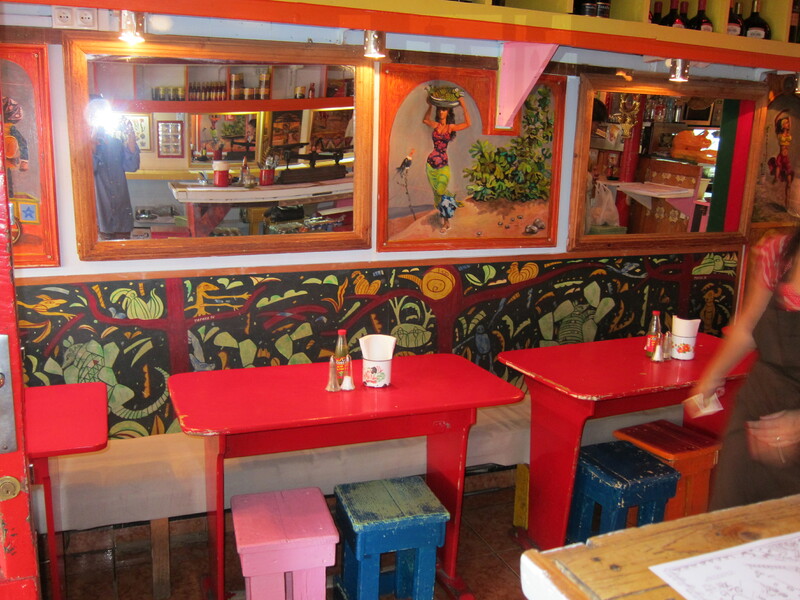 The painted part is the back of a built -in banquette on the back side of the tables. No doubt more comfortable than the stools on the other side! 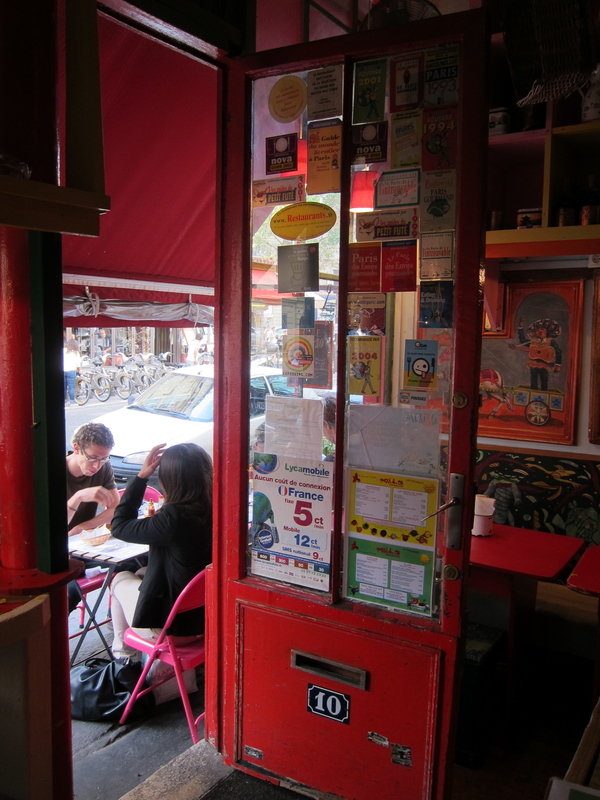 Pretty red door providing peek of pink tables. 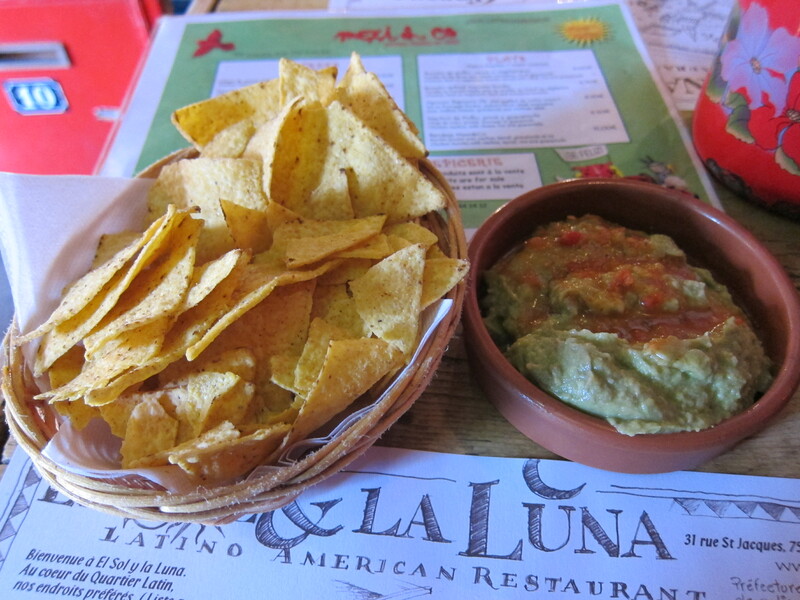 Starter of chips and guacamole. These two dishes and a beer comprised the lunch special, which was a bargain at 10 euros. The food was not as spicy as I would have liked (the French wouldn’t eat it if it had any kick to it at all), but was good and was a nice change from the usual restaurant offerings. There was a margarita on the menu (6 euros) but I saved it for next time. Here is the food side of the menu. So even though I didn’t buy a thing to take home, I was very satisfied with today’s field trip. I can’t wait to take family and other Tex-pats- I think they will be pleasantly surprised and will welcome a little flavor from home. Maybe I”ll sneak in some pickled jalapeno in a zip lock bag, just to spice it up a bit. On the way home I passed by this place. I’ll have to ask Mark if we have any cousins here. If we're ever full here, perhaps you can stay there. Just around the corner from the metro I was taking home was this little monument, surrounded by a green square full of people enjoying the sunshine. I love the blue accents. How's that for a Paris sky? Finally, I want to share a little metro mood music with you. The station I used to catch the metro home is so big that one kind of needs a rest stop on the way to one’s platform. These kids were gathering quite a crowd. I managed to escape the smiling man who was peddling their CD. I did throw them a euro, though. I can’t even tell you how long it took to upload that little video, so you must each watch it again, even if you didn’t really like it the first time. I mean it. Have a good weekend, mes amies. You may have better Mexican food, but I bet you won’t find a chocolate gorilla for dessert! Loved your video. What a treat to run across something like that in the metro. Glad you found a little bit of home over there. Really liked the chocolate gorilla too. Yea! I’m so glad you liked the video ! I guess it was worth the time it took, after all. I loved the video and think you should have bought a CD! Can’t believe you found that Mexican restaurant! You are so taking me there when I come to visit. 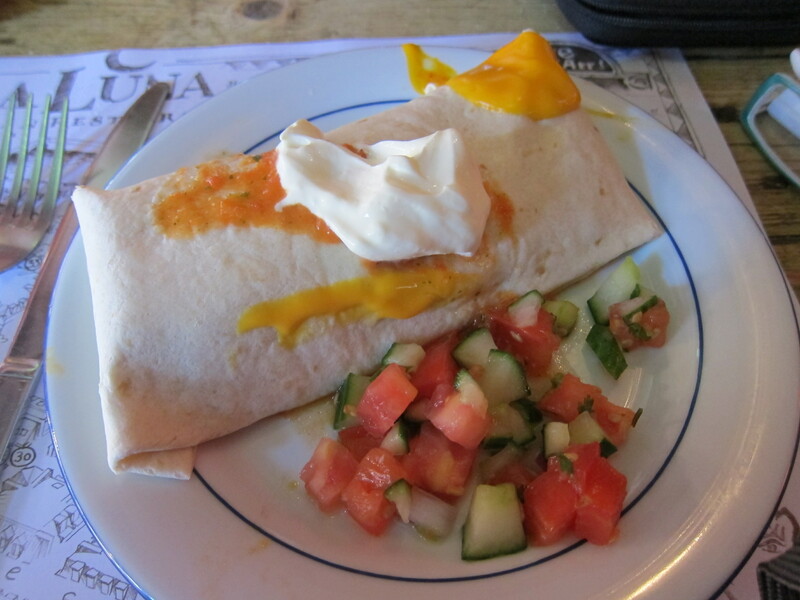 We just had Mexican–the Chef made fajitas! We’ve been dying here without our tacos, guacamole and salsa. We’ll have to check this place out! 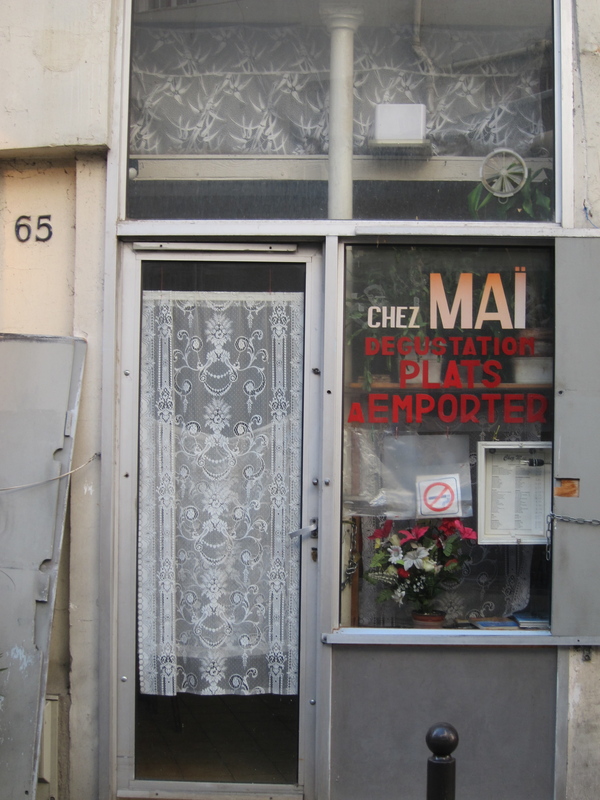 Yeah, and there is a much bigger place right around the corner on St. Jacques called Le Sol and La Luna or something. Let me know if you go! Love the video! Worth all that work. Maybe you need to keep some cilantro in your purse to dribble or shake or whatever on your food and a little pepper. BUT did they have the ice for your l’eau? That was always a challenge for us. Love this whole post! C’est magnifique! And SO proud of your embedded video! Did you buy a cd from that dapper man in the black turtleneck? Tell me that didn’t make me drool; we’re months and months from turtlenecks. I loved seeing your glasses in the one photo – a little bit of you that made me feel like i was right there! Bon Weekend! I watched the video twice. Just for you. 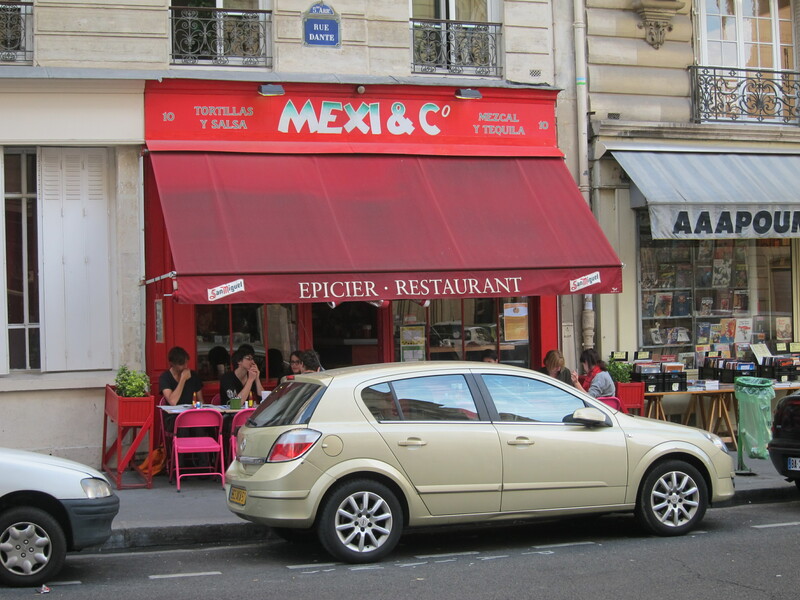 Thanks for the tip about the Mexican Restaurant – I’ve heard about a few different ones in Paris but haven’t tried any of them yet. 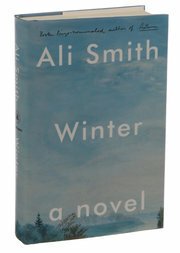 This one looks great! There’s also a BBQ place run by a woman from TX if you ever start craving pulled pork or ribs. Good luck getting everything ready for your parent’s visit! Is it possible that you might have found better Mexican food abroad than I have managed to find in Memphis? Que bueno suerte.